This article is about the castle. You may be looking for the world itself, the the field theme, the mines below the castle or the area based on memories of the castle. Issues: integrate descriptions of portions of the castle between KH1, Re:coded, CoM, and KHII. Hollow Bastion is a world in Kingdom Hearts and Kingdom Hearts Chain of Memories. 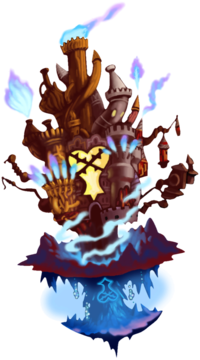 In Kingdom Hearts coded, it is divided into two episodes: Hollow Bastion I and Hollow Bastion II. 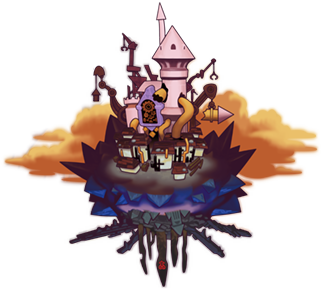 In Kingdom Hearts II, the world was expanded into the town and other areas. It appeared in a flashback to events from Kingdom Hearts experienced by Xion in Kingdom Hearts 358/2 Days. Hollow Bastion is a colossal castle that towers above the rest of its world, Radiant Garden. At one point, it was the only remaining part of the world, along with the waterways beneath it. Because of this, the world itself was known as "Hollow Bastion" in Kingdom Hearts, Kingdom Hearts Chain of Memories, and most of Kingdom Hearts II. However, it regains its original name of Radiant Garden by the end of Kingdom Hearts II, when Tron used his powers to show what the world was like before its destruction. Unlike the rest of the Radiant Garden, which poses as Final Fantasy's world, Hollow Bastion has no relation to Final Fantasy whatsoever. Ansem the Wise was the former ruler of this world. The castle was taken over by Maleficent and she claimed herself ruler, but she was simply being used. Sora and the rest of the party enter Hollow Bastion at the Rising Falls (逆巻く滝の底, Sakamaku Taki no Soko? ), appropriately named as there are waterfalls that run up instead of down. This area, as well as all other areas on the bottom reaches of the castle, contains magical bubbles that can transport the team under the solid water, or can be frozen to be used as platforms. Jumping on mystical floating rocks and ledges takes the party to the first of many magical platforms that are scattered throughout the castle. The platform takes Sora to the Castle Gates (正門, Seimon?, lit. "Front Gates"), the main entrance of Hollow Bastion which is made up of a set of balconies and lifts running outside the castle. From here, the party can travel down into the underground water system or enter the castle itself. Going down the nearby platform or leaping off the edge of the balcony takes the party to Base Level (基部, Kibu? 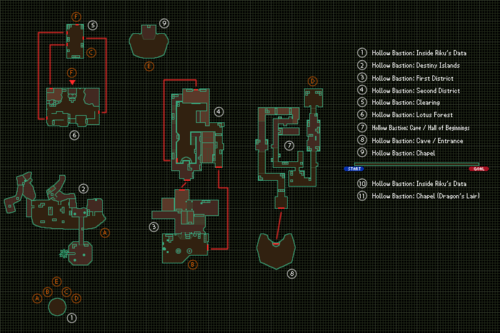 ), an area full of ledges, switches, and enemies. Successfully climbing to the balcony near the entrance earns extra treasures, while taking a nearby bubble carries them to the Waterway (地下水路, Chika Suiro?, lit. "Underground Waterway"), where a series of gates, switches, and bubbles must be navigated to operate the castle gate controls. Off of the Waterway is a small room, the Dungeon (地下牢, Chika Rō?, lit. "Underground Dungeon"). Going through the doors at the other end of the Castle Gates area takes the party to the massive two-level Entrance Hall (エントランス, Entoransu?, lit. "Entrance"), where a fight against Riku takes place. To continue onwards through the castle the puzzle at the end of the hall must be solved; solved, it allows access to the second half of the Castle Gates. Taking the left door in the Entrance Hall leads the party to Library (書庫, Shoko?, lit. "Archive"), also the site of a large puzzle involving organizing misplaced books. Belle, Yuffie, Leon and Aerith can later be found here after the Hollow Bastion Keyhole is locked. Also accessible from the Library is the first of many entrances to the Lift Stop (トロッコ乗場, Torokko Noriba?, lit. "Tram Stop"), a junction point for the series of magical tram lines that snake throughout the castle. Each route is separated from the others by mystical barriers, and many passages and hallways also converge at this hub. The ceiling of the Lift Stop is decorated with stain glass. Continuing up the castle by taking the lift on the other side of the Castle Gates area is the Great Crest (大紋壁, Daimon Kabe? ), an enormous bas relief of the Heartless emblem, where the largest of the magic lifts is located. After a long and slow journey across the front of the bastion, the party is dropped on the other side, where they can take the Lift Stop to the next area, the High Tower (高楼, Kōrō? ), where a smaller crest can be moved to create a way up to the upper levels of the castle. Through the Lift Stop at the opposite end of the High Tower is the entrance to the Castle Chapel (礼拝堂, Raihaidō? ), where the exit to the next room is sealed until Maleficent is defeated. There is also a secret area, where the Dragon and Xemnas are fought. Once the seal is broken, the party arrives in the Grand Hall (大広間, Ōhiroma? ), where the Princesses of Heart are held captive and the Keyhole to Darkness forms. Inside the Grand Hall is a Heartless Emblem-shaped portal leading to a small dimension known as the Dark Depths (闇の淵, Yami no Fuchi?, lit. "Edge of Darkness"). Here, Sora and company fight off the Behemoth guarding the Keyhole from being sealed. Access to the castle is very limited in Kingdom Hearts II. During the second trip to the world, the way to the castle is unlocked and leads to the Postern (城通用口, Shiro Tsūyō Kuchi? ), the site of a save point and the base entrance to the bastion itself. Going inside, the party must navigate the twisting Corridors (廊下, Rōka?) before reaching the end at Ansem's Study (アンセムの研究室, Ansemu no Kenkyūshitsu?, lit. "Ansem's Laboratory"). Despite promotional images and movies for Kingdom Hearts II that depict Sora, Donald, and Goofy in battle in the High Tower area of the castle as it appeared in Kingdom Hearts, the area is nonexistent in the second game. Ansem's Study was the private study of Ansem the Wise in Hollow Bastion. The room contains a throne and desk, containers filled with hearts, and books. As leader of Radiant Garden, he used it to store his research on the heart. Mickey Mouse and Ansem often talked in there. There is a portrait of Terra-Xehanort in the study, though it is unknown if Ansem or Terra-Xehanort put the painting up there. Behind the painting, it shows the password which are the Princesses of Heart. There is a secret passage in the wall that leads to Ansem's Computer. Ansem's Computer is a complex computer system used by Ansem the Wise during his rule over Radiant Garden, and later used by his apprentices after his exile. It contains an elaborate network copied from ENCOM, containing the Space Paranoids world, which was updated and modified for research purposes. The computer once held a vast variety of information regarding many subjects studied by Ansem and his apprentices, such as the Heartless, Nobodies, Organization XIII, and Ansem the Wise himself. However, when Sora, Donald, and Goofy tried to access the information on their enemies, they found that all of it was corrupted, possibly by Xemnas. The only thing that did come up was a picture file of the true Ansem the Wise, leading to the truth being revealed about Xehanort's Heartless. The computer continues to be used by Xemnas to access the Chamber of Repose located several miles below the factory. While the password to Ansem's D.T.D. dataspace is the names of the Seven Princesses of Heart, Xemnas's password to access the Chamber of Repose is the original names of Ansem the Wise's six apprentices: Xehanort, Even, Braig, Dilan, Ienzo, and Aeleus. Kingdom Hearts II Final Mix It also allows access to the Heartless Manufactory on the floor below the room, and activates the laser that transports users to Space Paranoids. On the other side of the computer room is a small balcony overlooking the Heartless Manufactory. 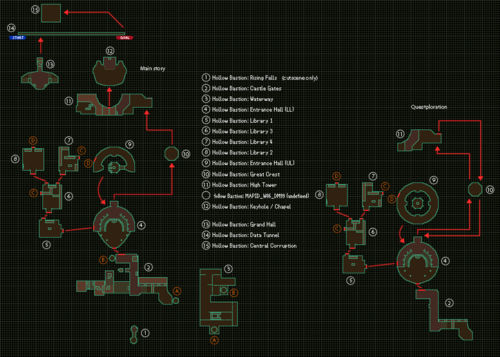 Inside Riku's Data, the main hub of Hollow Bastion II. In Kingdom Hearts coded Hollow Bastion I is very similar to the Hollow Bastion from Kingdom Hearts. Data-Sora starts his journey in the Castle Gates, he then goes to the Waterway as soon as he finds the gate is locked shut to find a way to unlock the gate. After opening the gate, he soon joins with Goofy at the Entrance Hall (LL) (エントランス(下部), Entoransu (Kabu)?, lit. "Entrance (Lower Level)"). After examining the Heartless slot on a door, Data-Sora and Goofy visit the library, which is broken down into Library 1 (書庫1, Shoko Ichi?, lit. "Archive 1"), Library 2 (書庫2, Shoko Ni?, lit. "Archive 2"), Library 3 (書庫3, Shoko San?, lit. "Archive 3") and Library 4 (書庫4, Shoko Yon?, lit. "Archive 4"), to search for the missing emblems. Data-Sora also chases after Donald in the Waterway. After the party is set, they travel to the Great Crest via a huge lift, leading to the High Tower. After obtaining the last emblem, they can finally chase after Pete who waits in the Grand Hall. Data-Sora encounters Pete and Data-Riku in the Keyhole, at the Chapel (鍵穴:礼拝堂, Kagiana: Raihaidō?, lit. "Keyhole: Chapel"). 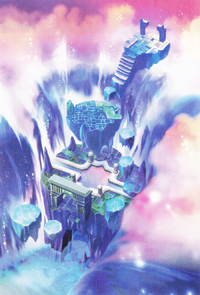 Hollow Bastion II is set within Data-Riku, who is lying comatose in the Grand Hall. From Inside Riku's Data (リク データ内部, Riku Dēta Naibu? ), Data-Sora can enter five doors. The first takes him to Destiny Islands (デスティニーアイランド, Desutinī Airando?). The second takes him to Traverse Town, divided into the First District (1番街, Ichiban Machi?) and Second District (2番街, Niban Machi?). The third takes him to Wonderland at the Clearing (中央広場, Chūō Hiroba?, lit. "Central Square"), leading to the Lotus Forest (ハスの森, Hasu no Mori?). 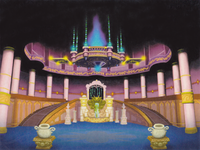 The fourth takes him to Agrabah at the Cave / Entrance (タイガーヘッド, Taigā Heddo?, lit. "Tiger Head"), leading to the Hall of Beginnings (始まりの間, Hajimari no Ma?). The final door takes him to Hollow Bastion's Chapel (礼拝堂, Raihaidō?) where he encounters the bugged Data-Riku. The side-scrolling segment takes place Inside Riku's Data, with the Dragon Maleficent encounter within the Chapel (Dragon's Lair) (礼拝堂(竜の間), Raihaidō (Ryū no Ma)?). Data-Sora also revisits the Grand Hall before the 3D shooting segment takes place in the Data Tunnel. Data-Sora defeats Sora's Heartless at Central Corruption (変異データ中枢, Hen'i Dēta Chūsū?, lit. "Central Data Mutation"). During his time in Radiant Garden, Ventus sees his friend, Mickey, in the distance and gives pursuit. His chase leads him to one of the doors of Hollow Bastion, guarded by Dilan and Aeleus, who appear to be asleep. When Ventus approaches, they suddenly wake up and deny him entry, instead telling him to go home before the Unversed harm him. When the Trinity Armor appears, Dilan and Aeleus prepare to aid Ventus against it, but Even appears and orders them to carry on guarding the castle. After Terra-Xehanort is saved by Aqua, Ansem the Wise has him brought to the castle to recover, where they decide that the amnesiac youth's name is "Xehanort". Later on, Lea and Isa make their own plans to break into Hollow Bastion. Though they are successful in getting inside, they are spotted by Dilan and Aeleus and thrown out. The day after Lea and Isa had joined, Ansem's other apprentices, led by Xehanort, overthrew their former mentor, banishing him to the Realm of Darkness, and furthered Ansem's original drives to include more mechanical components. The result is a twisted bastion; half beautiful castle, half distorted factory. According to Leon, Maleficent invaded Hollow Bastion's world with her Heartless nine years before the events of Kingdom Hearts. Some residents managed to escape, many of whom end up in Traverse Town. However, the youngest known resident, Kairi, is sent into the oceans of the worlds by Xehanort and ended up in Destiny Islands due to Aqua's spell. 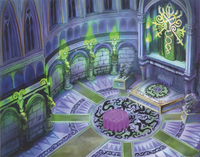 During her reign in the castle as one of Ansem, Seeker of Darkness's minions, it is probable that Maleficent either created or remodeled the castle's keep, which has decorations and models of roses and her thorned plants. During the destruction of Destiny Islands, Riku is approached by Ansem and opens his heart to the darkness, allowing Ansem to linger within his heart, and steps into a Corridor of Darkness. He awakens some time later in the Rising Falls. Here, he is greeted by Maleficent, given a room to stay in, and is gifted with the Soul Eater blade. Sora, Donald and Goofy arrive at Hollow Bastion in time to find Riku attacking another intruder, the Beast. Sora, Donald, and Goofy confront Riku, but he declares he is the Keyblade's true holder; it jumps into his possession, leaving Sora defenseless except for his old wooden sword. Shocked at this revelation, Sora collapses to the ground. Riku departs, and Donald and Goofy, having been ordered to follow the Keybearer, reluctantly follow him. The Beast staggers on despite his injuries, and Sora quickly gets over his shock to help him. The Beast reveals that he is looking for someone important to him, and refuses to depart without her. Sora, sympathizing, takes up his old wooden sword, and the two team up to enter the castle. After traversing the castle waterways to unlock the main door, Sora and Beast enter Hollow Bastion. Beast witnesses an illusion of Belle transforming into a Heartless, and, enraged, jumps at the Heartless, with the doors slamming shut behind him. Riku, Donald, and Goofy appear soon after, where Riku orders Sora to give up, though Sora refuses to leave without Kairi. Sora informs Riku that while the darkness may destroy his body, it can't harm his heart, and Riku decides to test Sora's theory by firing a Dark Firaga attack at him. Sora, believing it to be the end, braces himself, but Goofy rushes in and blocks the blast with his shield. After being questioned by Riku, Goofy swears that he will never betray King Mickey, but won't betray Sora after all that they have been through together, and asks Donald to apologize to the King for him; however, Donald also chooses his friendship with Sora over King Mickey's orders and rejoins Sora. Sora informs Riku that he doesn't need the Keyblade; his friends and heart are the only weapons he needs. Sora's strength of heart with his friends back by his side pulls the Keyblade away from Riku and back to him. After a fierce battle, Riku is defeated and flees. Beast rejoins the party after watching the encounter, observing that Sora's heart was what helped him win. Riku is upset at losing the Keyblade, but encounters Ansem, Seeker of Darkness, who promises him that he can make Riku's heart stronger through darkness and allow him to regain possession of the Keyblade. Jealous and angry at Sora and shamed over his loss of control of the Keyblade, Riku succumbs to his pledge and powers, and becomes consumed by the darkness. In the meantime, Maleficent has attempted to use the gathered Princesses of Heart to open the Bastion's Keyhole. The Heartless-possessed Riku meets with her to check her progress, where Maleficent declares she will control and use the darkness for her own purposes; however, neither she nor Ansem-Riku can unlock the Keyhole without Kairi's missing heart. Sora and friends manage to travel through the labyrinth of a castle to reach the chapel; there they meet with and confront Maleficent. Overconfident in her abilities and underestimating those of Sora's gang, she is soundly defeated. Escaping back to Riku for help, she is stabbed through the heart by his Keyblade of heart, made from the hearts of the six Princesses. It unlocks the darkest parts of her heart and allows her to transform into a large, powerful dragon; however, Sora's party defeat her again, and she is consumed and burned away by the darkness. Riku then appears and reveals that Maleficent was merely a pawn of the Heartless, unable to see the darkness swallowing her heart. He then departs and Sora and company travel to the Grand Hall, where the Keyhole and Princesses are located, to find and confront him. There, Sora finds Kairi unconscious on the floor in front of the partially opened Keyhole. He tries to wake her, but Riku appears to tell Sora her heart is missing. Riku continues to tell Sora that Kairi is one of the princesses and that her heart is within him. Sora is able to realize that Riku is no longer in control of his own body. Riku knocks both Donald and Goofy back behind a preset barrier, and Kairi's heart reacts to the Keyblade of heart's power, causing Sora crippling pain. Xehanort's Heartless then attacks him, but Sora recovers and blocks the strike in time. After an intense battle over who would possess Kairi's heart, Sora emerges victorious. Riku disappears, but the Keyhole begins reacting to the presence of Kairi's heart. Sora attempts to lock the Keyhole, but without Kairi's heart, it is not complete and cannot be sealed. Sora puts two and two together and realizes what he has to do; despite Donald and Goofy's desperate pleas, Sora stabs himself with the Keyblade of heart left in Riku's wake, releasing all of the princesses' hearts (including Kairi's) and completing the Keyhole, but Sora falls into darkness himself. Kairi wakes just in time to see Sora disappear. As Kairi, Donald, and Goofy mourn the loss of Sora, Ansem, now in full possession of Riku's body and having shaped it into one resembling his original human self, reappears, declaring that Kairi's purpose is over, effectively deciding to kill her. Donald and Goofy bravely make a stand against Ansem, but both know that, without Sora, they may not be able to stop him. However, before Ansem can attack, Riku projects himself from his stolen body, manages to establish enough control to stop him in his tracks, and warns Kairi and the others that the Heartless called by Ansem will soon overrun the castle at which they heed and run to escape. The three return to the entrance, and hesitate due to Kairi's reluctance to leave Sora and Riku behind; Goofy himself is still concerned about the Keyhole (apparently failing to realize that, without Sora and the Keyblade, the Keyhole cannot be stopped). An apparently non-hostile Heartless arrives; Donald shouts at it to get lost and whacks it over the head with his staff, but Kairi realizes that the Heartless is, in fact, Sora. At that moment, massive legions of Heartless attack, and swarm Kairi and Sora's Heartless, much to Donald and Goofy's horror. However, a brilliant flash of light blows the Heartless back, and in place of the Heartless, there is Sora, fully restored. Beast stays behind to hold off the Heartless and continue looking for Belle, and so the group departs Hollow Bastion. Cid manages to find a way to allow them to return and seal the Keyhole. They return and help Beast reunite with the re-awakened Belle, and jump through the Keyhole to fight a Behemoth Heartless. After a conversation with Leon's group, who have returned to restore their home world, Sora seals the Keyhole at Hollow Bastion. In the Kingdom Hearts Final Mix version, Sora also has his first encounter with Organization XIII in the chapel by way of Xemnas, here known only as "Unknown". After some cryptic messages (such as stating that Sora is incomplete and looks just like "him"), Xemnas departs. It is revealed in Kingdom Hearts II that this battle takes place shortly after Xemnas recruited Roxas into the Organization, and he fought Sora to test his abilities. Riku's bedroom in Hollow Bastion. Upon arriving in the Basement of Castle Oblivion, Riku enters a memory simulation of Hollow Bastion. Guided by a voice, Riku explores the simulation, even coming across his old bedroom, and eventually encounters Maleficent, who tries to convince him to rejoin her. Riku refuses, and she promptly transforms into a dragon to battle him. He ultimately triumphs. Later, Sora and company also arrive in the simulation, albeit higher. They encounter the Beast, who is being told by Belle to stay away from her. Noticing his plight, Sora decides to help the Beast. As the group traverses the simulation, they encounter Maleficent, who is holding Belle hostage. Maleficent declares to Beast that Belle still loves him, but is afraid to say it to avoid detection. Maleficent gives Beast one last ultimatum, but Beast refuses. Outraged, Maleficent transforms into a dragon to battle Sora and company. Sora eventually defeats Maleficent, and as she fades away, Belle and Beast rekindle their relationship. 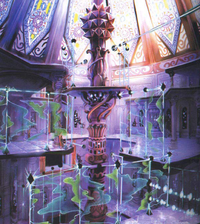 A statue appears here in the Entrance Hall that was not present in Kingdom Hearts. During Kingdom Hearts 358/2 Days, when Roxas experiences a short sequence of Sora's memories, the keyhole to Hollow Bastion can be seen as Sora releases his heart and his body dissipates. After Maleficent destroys Data-Sora's Keyblade in the datascape's version of Agrabah and captures Data-Riku, Pete takes Data-Riku to the Datascape's Hollow Bastion. Without his weapon, Data-Sora is unable to fight, so Mickey travels there himself, leaving Donald, Goofy, and Data-Sora at Disney Castle. However, Sora runs off to Hollow Bastion on his own to confront Pete, and he manages to unlock the castle gate while dodging Heartless. Inside, Pete traps Sora and summons a horde of Heartless to attack, but Sora is rescued by Goofy. The two of them begin searching for a way to follow Pete deeper into the castle, while searching for Donald, who got separated from Goofy when they entered Hollow Bastion. Sora and Goofy find Donald in the waterway, and the three of them explore the castle, with Donald and Goofy breaking Bug Blox and fighting Heartless in place of Sora. They find the pieces of the Heartless emblem that unlock the door leading to the upper levels of the castle, and at the High Tower, Data-Sora reflects on the bond he feels with Donald and Goofy. The three of them confront Pete in the Grand Hall, where he traps Donald and Goofy in a cage of blox. Desperate, Sora manifests a new Keyblade from his evolving heart and frees them. Pete retreats into the Keyhole, followed by Sora, who defeats him despite his own powers in the datascape. Pete then sets Data-Riku on him, having corrupted his data with bugs, but Data-Sora manages to subdue his friend after a drawn-out battle. Although Data-Sora and Data-Riku emerge from the Keyhole, Riku's data is thoroughly corrupted, prompting Sora to enter Riku's personal datascape to destroy the bugs, in Hollow Bastion II. After visiting manifestations of Riku's memories of different worlds, Sora defeats the main source of the corruption, which takes Riku's form. Maleficent attempts to block Sora from returning from inside Riku's data, but he emerges, and he defeats Maleficent's dragon form in the chapel. Mickey, Donald, and Goofy say goodbye before returning to the real world, but when the datascape begins erasing itself, Data-Sora sets off through the Final Keyhole for the innermost part of the datascape to retrieve Maleficent and Pete and to confront the source of the corruption. As Data-Sora progresses through the Datascape's Castle Oblivion, he enters a room based on his visit to Hollow Bastion. He chases after Pete, using switches to progress, and defeats him. Pete calls Maleficent, who brings them to a long, trap-filled room, forcing Sora to traverse the obstacle course to reach the far side of the room. Upon confronting the two, Sora is returned to the Entrance Hall, with an Ending Card for Hollow Bastion. Later in the real Hollow Bastion, a resurrected Braig speaks with Young Xehanort about Master Xehanort's plans. While both are unsure of what Master Xehanort really wants, a comment of Young Xehanort's causes Braig to realize that it may have something to do with the Keyblade War and muse on whom to take along. This page was last edited on 7 April 2019, at 22:06.